One of our long-term customers, Andy Parkes, was developing Blitzkrieg-era Belgian Forces when he encountered information on Belgian artillery doctrine (as opposed to the usual emphasis on the weapons). This showed that they basically used a centralized system which was similar to the French but less flexible. Here is what Andy found, with some ideas for using Belgians in Battlefront:WW2. It should be noted that the Belgians were even deeper into the WW1/Fortress mentality of the the French, expecting to fight from prepared fixed positions. The Germans spectacularly neutralized the defensive positions with airborne forces, especially with their attack on the "state of the art" fortress at Eban-Emael. Artillery was control was at two levels. The first was the "Groupe", a permanent formation that was either a regiment or part of a regiment (battalion). It seems that The second was the "Groupement" which was an functional unit consisting of all the artillery assets that could cover a sector. Each battery evidentally established an observation post, and the groupe set up 2 more. There may have been more at the regimental and divisional level. These posts prepared maps and charts identifying possible targets and reference points. A target request would be passed to groupe or groupement HQ which would allocate the fire mission to the observation post with the most suitable position for observing fire based on these maps and charts. The signals network was all based on telephone links. The batteries, observers, groupes, and groupement were all linked together in a fairly comprehensive net. Radio communications were being introduced, but were not standard. At each infantry battalion HQ there was a liaison officer (referred to as an agent de liaison observateur) who was in contact with the head of the liaison detachment attached to the infantry regimental HQ. This liaison detachment was in turn linked to the artillery regiment (groupe) or higher level (groupement) artillery HQ. The ultimate fire mission control was done by the commander of the groupe or groupement. For an infantry division this commander was the CADI (Commandant d'Artillerie de la Division d'Infanterie) who was part of the divisional staff. Very often the CADI would control not only divisional artillery assets but the assets of the groupement, including fortress artillery. One of the interesting features of this setup was that the FOs were not actually the ones requesting the fire missions. Instead, a request for fire would come in, a higher level commander would determine which FO could see the target, based on the pre-established fire plan, and then allocate the fire mission to a specific FO who would then control the mission. This request would be passed to the liaison "agent" who contacts the liaison detachment attached to the Infantry Regiment HQ. From here, presumably having informed/consulted the I.R. commander the request is passed on to Artillery Regimental HQ. Here the fire mission would be allocated to suitable batteries. If the battery observation post was unable to provide spotting the battery would request groupe to allocate a suitable observation post. Fire is opened with fire corrections given by the designated observation post. While this system could work well in a static environment, it definitely shows its WW1 origins and would be extremely vulnerable to disruption if the static defense lines were broken, observation posts became casualties, or the centralized command structure came under attack. This happened early in the 1940 campaign when the Fortress of Eban Emael was taken out on the first day of the attack, punching a hole in the defense, disrupting communications, and allowing Germans to penetrate into the rear. Suddenly, the carefully prepared fire plans and groupement asset allocations became obsolete. The lowest two levels of Belgian artillery were the battery of 4 guns (2 BF templates) and the battalion of 3 batteries (6 templates). This organization was fairly standard among all of the different types of guns (75mm, 105mm, 120mm, 155mm). The next higher organization was the regiment, but the composition of the regiment depended on the organization which it was supporting. *The Chasseur Ardennais divisions were organized as part of the 7th Army Corps and would be supported by artillery from the 20 Motorized Corps Artillery Regiment. The Belgians used a basically triangular infantry structure (regiment = 3 battalions, division = 3 regiments) similar to most of the armies of this time. At least for the Active and First Reserve infantry divisions, the artillery allocation probably would have one 75mm regiment in direct support of each regiment, with the other two divisional 75mm regiments and one of the battalions of the 105mm regiment in General support. However, remember that all of the artillery in the groupement would technically be available if a juicy target presented itself. Belgian Artillery fires by Battalion and may use the special battalion shelling missions of the French. Belgian Artillery uses the "Fire Plan" concept of the French, and is considered to have a fire plan in place unless the scenario specifies otherwise. Give the Belgian player a few pre-registered points as part of the Fire Plan. Both FOs and HQs are necessary to call for a Belgian Fire Mission. An FO must be able to spot the target area. FOs may not initiate fire missions on their own. Only HQs may initiate fire missions. While it looks as though the liason officer was attached at the battalion level, company HQs would contact their battalion HQ to request a mission. As this is passed up the chain, requests from lower level HQs are less likely to be successful. 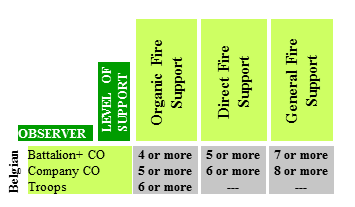 If an FO or HQ is moves, it may not be used to initiate or direct a fire mission until it successfully completes an "Improve Position" roll (note that this is much more restrictive than the usual requirement to emplace), representing the re-establishment of phone communications and re-integration into the fire plan. If an HQ is destroyed and then re-created by a "take command" action, the new HQ may not call for fire.